When Marks & Spencer was approached by a customer who told them she could not find a post-mastectomy bra, they developed one, with the help of that customer and the breast cancer charity that she was supported by. When Legal & General set out to review its Over-50’s life insurance product – a standard bi-annual process to ensure a product is fit for purpose – they added an extra dimension to the usual procedure: they invited in older people’s charities to comment on how customer-friendly the product really was. And when Howdens started to gain insight on the needs of disabled people through its partnership with Leonard Cheshire Disability, they turned their learning into a whole design mentality that they’ve applied to their range of ‘inclusive kitchens’ for a mainstream customer base. The message is clear: Charities have a huge amount of knowledge and expertise – or social insight – on issues that businesses need to know about. Social insight was the subject of our breakfast event on 4th October, when friends from a whole range of corporate organisations gathered to discuss examples of how this approach is starting to play out in businesses, for the benefit of employees, customers – and the bottom line. On the employee front, we heard how social insight can help business to better grasp circumstances that affect their staff, such as mental health or LGBT issues, resulting in workplaces that are more understanding and managers with more empathy and skill when supporting colleagues. On the customer front, it wasn’t just bras, kitchens and life insurance. We heard how social insight helped Credit Suisse to develop braille bank statements, Boots to formulate its Botanics skincare range and Legal & General to improve service for customers up to their knees in flood water. But these are the early adopters – and at Three Hands we are now focused on helping businesses to make this approach to market research and innovation the norm, not the exception – and in the process to reward charities for their expertise. Charities must be valued. View them as subject matter experts, consultants, allies in the development of socially useful solutions, and reward them properly. The CSR manager will play a pivotal role. She or he will need to network par excellence with colleagues in market research, customer services, product development and innovation for this approach to fly in their organisation. This is mainstream, not niche. Yes, there are opportunities to better support so-called vulnerable customers, but this approach can – and should – result in an overall design mentality that will benefit customers as a whole. It needs a process. Just as innovation relies on a structured and deliberate process, so does this, and it should include the non-profit partner(s) throughout. And it needs an intermediary/ facilitator to make it happen. For more information or a discussion please contact Jan Levy at Three Hands – jan@threehands.co.uk / 020 3397 8841. 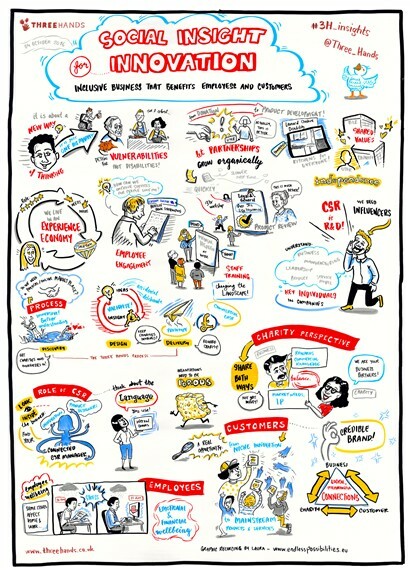 For a PDF version of this report, including the graphic illustration of the event, click here.